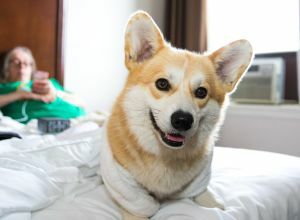 Clarence | Pembroke Welsh Corgi à Montréal. Dernière connexion 24 jours . Great dog, so easy to walk and get along, thank you! Great and confident walker! We had a blast walking through Old Port. Clarence is precious! Very smart ! And loves to fetch. Clarence is a well-behaved corgi and fun to be around who knows how to take you to his favorite dog park. Karly was very nice and explained his habits before taking him on a walk. Also he loves to run so got a very good workout with him. He is a great dog loved him would walk him again! He was a slow walker at first, but once he got comfertable he really picked up the pace. Super friendly and very gentle. Not to mention the cutest dog out there! Great dog really! Knows his way around to the dog park Haha Very easy to walk and play with. A very wonderful dog! He is very loving, friendly, and loves to play with other dogs. He also did not plush on leash. Clarence was great, very friendly and calm. He was great with my 4yr old son. We can't wait to walk with him again soon! We've had a fantastic time with Clarence running around the dog park and playing with friends! Lobita and Clarence had a great time. We went to the dog park and loved it. Clarence is the best, we went to a dog park and he had a grand time running forever. Clarence was super chill, 10/10 would walk again. The cutest and friendliest dog! Clarence is easy on the leash and very obedient. He is also easygoing with other dogs and very playful at the dog park. It's always a real treat to walk him!